Monarch Corona is an interesting card set. I was unfamiliar with them, but a google search led me to a great card blog entitled, "Can't Have Too Many Cards". There I learned that Monarch Corona were lithograph cards, printed in limited edition, by a printer named Jim Miller Jr. There was a link to the Monarch Corona on the blog, but when I went to the site, sadly it said that no more sports cards were being printed; and that the entire inventory was sold to a couple of EBay dealers. One of those, is a fellow named, Jim Milo. His site is called Grouchy Old Man Baseball Cards. 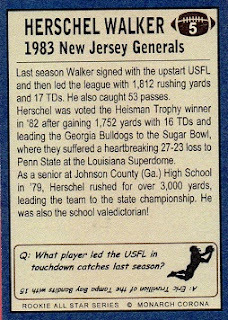 It's from Jim that I purchased the above Herschel Walker card. I have seen a few other cards from this set; I know there is a Dan Marino #8; a Tony Dorsett #9, a Warren Moon #11, and a Lee Roy Selmon #15. I had hoped that a checklist might be available, but when I contacted Jim, he did not have a checklist, nor did he know exactly how many cards were made. 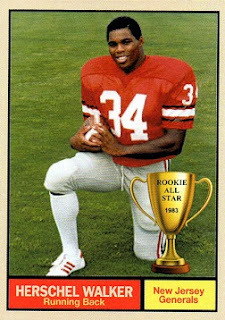 Without a checklist, I can't enter it into the Trading Card Database, but it's still a nice card to add to the Hoard.